Beijing Olympics draw closer for the winners of the quarter-final games: First to qualify is Latvia as they surprise the French national team (64-62). This victory was inspired by a player based in Montpellier, Gunta Basko, who led her team in scoring. Another key factor for Latvia's national team was Anete Jacobson-Zogota, who spent many years in Bourges, with her hitting hoops at critical times. France finally found their 3-point shooting and made a heroic fight-back in the final stages of the game coming back from a double-digit deficit butfell short at the end. This was also Audrey Sauret-Gillespie's 200th appearance in the French national team, finishing with 10 points and 6 assists, playing with 3 stitches in her forehead. Next to qualify is Belarus as they shocked the women's European hierarchy by beating the defending champion, the Czech Republic (54-46). Audrey Sauret-Gillespie made her 200th appearance during the Eurobasket 2007 tournament while competing for the Olympic qualifiers (photo courtesy of Hervé Bellenger/IS/FFBB). She is the 12th French player to reach this landmark in the women's national team. 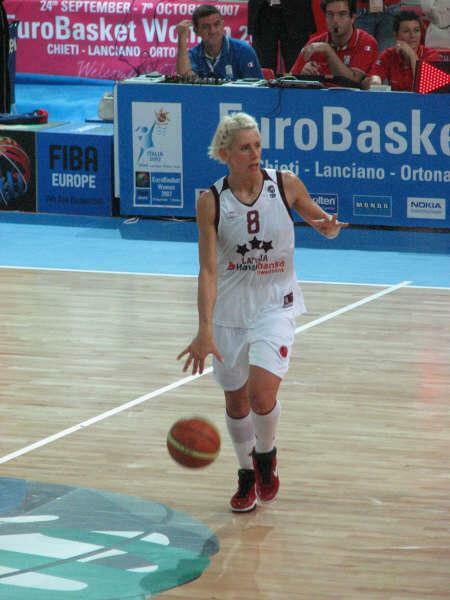 She made her debut in 1994 and is playing in her sixth Eurobasket participation. She was a member of the French squad that won the 2001 edition of Eurobasket in Paris. At the end of this championship she will return to Italy to join her new club Taranto. On the following day Russia and Spain surmounted the pressure and outpaced Lithuania (75-58) and Belgium (72-53), respectively. Although the losers of both matches made their opponents sweat for it. The four losers are now fighting for the 5th place, the last chance for a spot in the Olympic qualifying tournament. Latvia's Basko and Jacobson-Zagota both spoke in an interview after their victory about the team's dynamics and refused to be drawn into any discussion on their personal contribution. 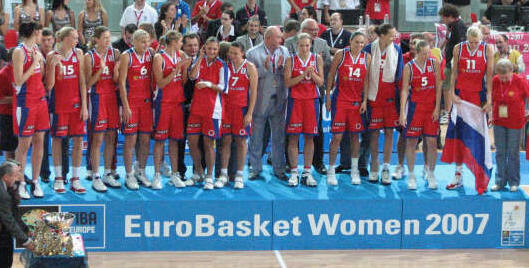 France met Lithuania and thought to have won the match until Egle Sulciute hit a 3-pointer with 12.6 seconds left on the clock at the end of the last quarter.Edwige Lawson-Wade played probably her best match in this tournament as she dished out nine assists and scored 11 points with 5 of her points coming in the last 60 seconds of the match. Unfortunately for the national team their poor free-throws in the final quarter gave the chance to their opponents (67-65) to get the last spot for qualification for Beijing 2008. The Czech Republic ended Belgium's (75-50) Olympic ambition early in the match with a clinical first-quarter performance. Spain and Russia fulfilled their potentials and beat Belarus (70-54) and Latvia (67-36, respectively. Both games were killed off early in the final period and also showed the difference in experience between the different national teams. The Czech Republic and Lithuania will play-off for the last European Olympic qualifiers' place. Czech Republic overwhelmed Lithuania (93-54) in a one-sided match and take the 5th European national team place for the World Olympic Qualifying Tournament for Women in 2008 and complete the European phase of the Olympic qualifiers. In the match for bronze Belarus (72-63) had to survive an amazing second-half performance from Latvia to take the third place in their first ever European participation. It was a disappointing end for Latvia who are the hosts for next EuroBasket in 2009. The final between Russia and Spain was a game of two halves. The first half of the game belonged to Russia demolishing in a "poetry-in-motion" play the hard-fighting Spanish team with a breathtaking performance. Spain left the court with their heads down, but after the interval they looked ready for combat and as soon as the official started the second part of the match, the Spanish team took the courage into their hands and played their heart out to come back to 4 points. It looked as if the game was escaping Russia, then Valdemoro's ball rimmed out and Russia took the chance to increase their advantage and held on to win (74-68). This match should be remembered for its quality of women's basketball as both sides gave a good show in demonstrating that a game is neither won nor lost until the final buzzer sounds. The Russian coach, Igor Grudin, commented after this victory his happiness of Russia qualifying directly for the Beijing Olympics and his hopes in winning a medal of some colour in next year's Olympics. The Spanish team has now missed their chance on direct Olympic qualification and now join Belarus, Latvia and Czech Republic in next year's Olympic qualifiers, the World Olympic Qualifying Tournament for Women, where 12 national teams will fight for five remaining places for Beijing Olympics. Before the presentation ceremony the tournament-all-star team was announced with Natallia Marchanka, from Belarus, Anita Jacobson-Zagota from Latvia, Olga Arteshina and Maria Stepanova from Russia and Amaya Valdemoro from Spain, who also received the most-valuable-player award (MVP). 7th/8th place match: Belgium had their first victory against France in an official competition. At the end of the game their head coach, Laurent Buffard, announced that his job was over as Belgium did not qualify for the Olympic qualifying tournament. As for France Jacques Commères, head coach, said that he was ready to step down as he was not able to obtain his Federation's minimum objectives which was the Olympic qualifiers. 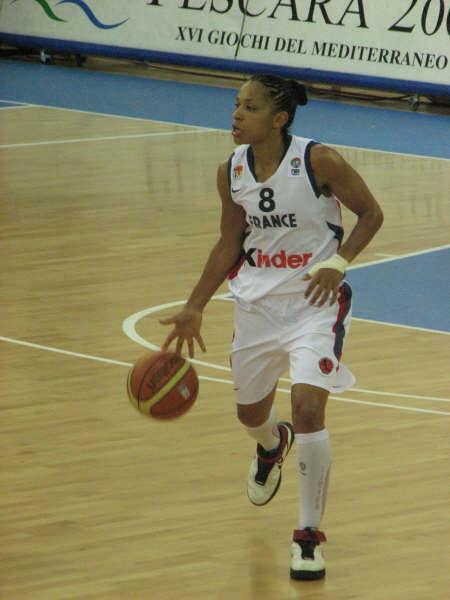 Sandrine Gruda from the French national team picked up her Fiba Europe young player of the year 2006 award, while Edwige Lawson-Wade (pictured below) finished as the tournament's assist queen with 4.3 assists per match. All in all France could have done better but they still showed a lot of promise for the future.